Vacation rental condominium. Sleeps 5, 2 bedrooms, 1.5 bathrooms. Cats, Dogs allowed. Pet Friendly, Large Crate Provided! Essentials: Coffee Pot, Blender and EVERYTHING Else You Need! 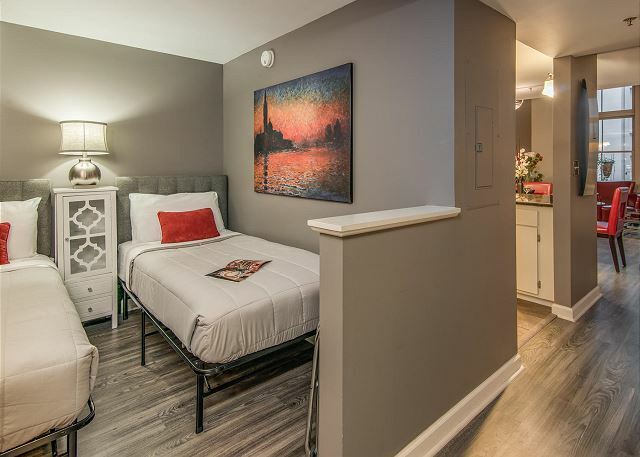 2 Twin Beds Downstairs, Half Bath Right Across the Hall! 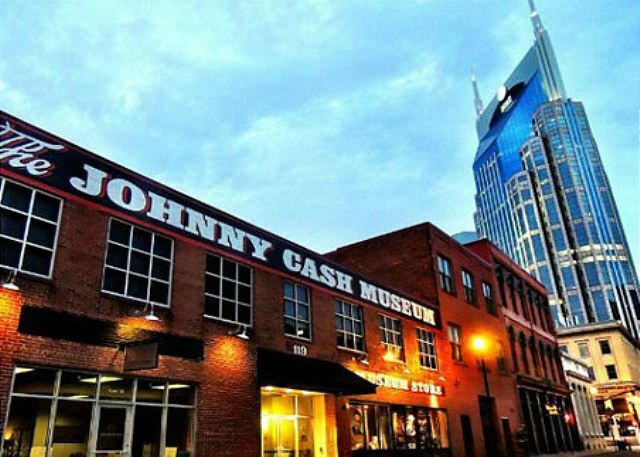 Johnny Cash Museum Just 3 Blocks AWAY! 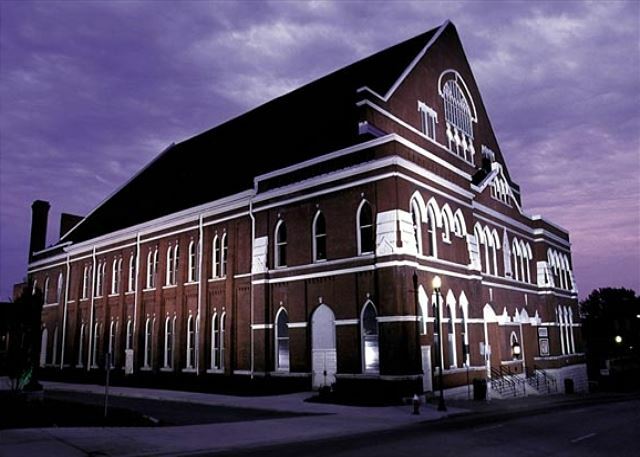 The Mother Church of Country Music - WALKING DISTANCE! Judy, thanks for the review! 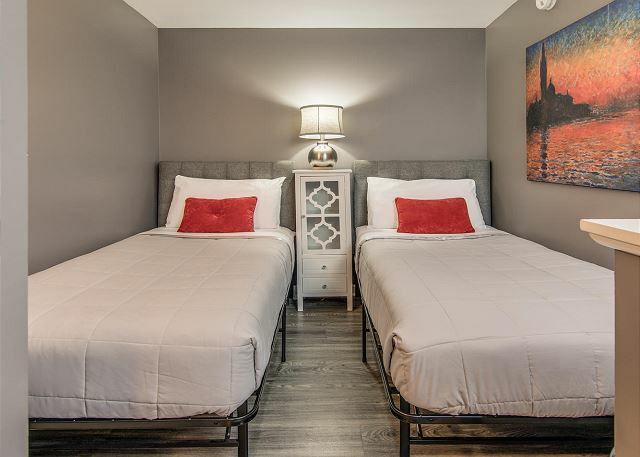 Our lofts are great if you want to be minutes away from all the fun in downtown Nashville. The best part is definitely that you can walk to everything. We are currently updating pictures on our website, so some of the furniture is different that what is shown. The building issues are being worked on as well. 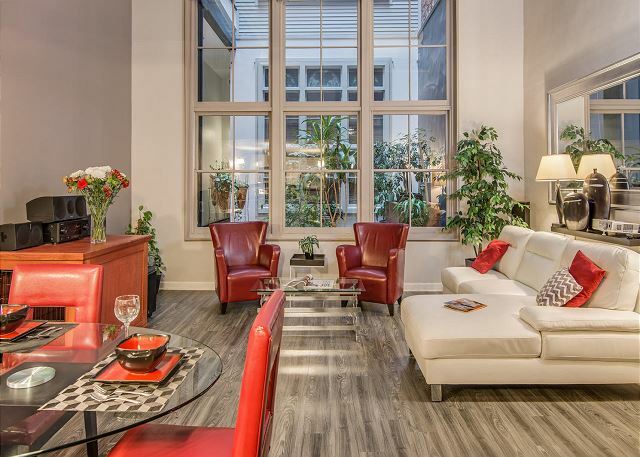 The historical fact is what makes our lofts extra special! Overall, we are glad that you would stay with Playlist again! We hope to see soon! Thank you for your review! We appreciate you taking time out to share your experience with us. 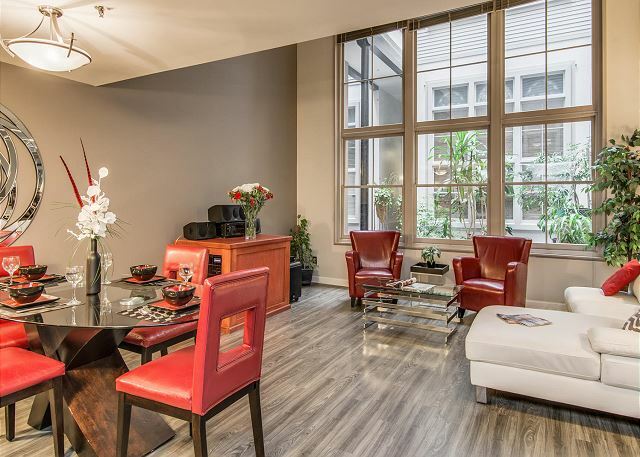 Yes, this property is located in downtown Nashville within walking distance to restaurants, bars, shopping, and lots of live music. It's an excellent location for sure! Glad you enjoyed the location and your stay in Nashville. Unfortunately the building does not offer a lot of outdoor lighting. With the location, most guest are out and about, and rarely notice. We hope you come back and stay with Playlist Properties again! Overall we had a great time in Nashville. The location of the unit was right in the heart of everything. Parking was an easy walk across the street and the team working for the owners was very helpful and polite. Our only bad comment was relative to the overall up-keep of the unit and parts of the building. Inside the unit there was broken furniture, several of the doors would not close due and the toilet ran almost all night when flushed. The unit in-general was large and well appointed but needed some TLC. The building when you walked in was also very nice but again needed some TLC. Paint and plaster was coming off the walls, several of the wall sconce light fixtures were clearly knocked by a passer or by luggage. They were hanging off of the wall in two locations. I am writing this because the building and units are very nice they just need a little love. I would not let this sway you away from staying here as our overall experience was great, the owners just need to do some updates. Great location and floor plan. Only issue was that I left a wireless speaker but it wasn't returned to me. I'm guessing the cleaning service found it. 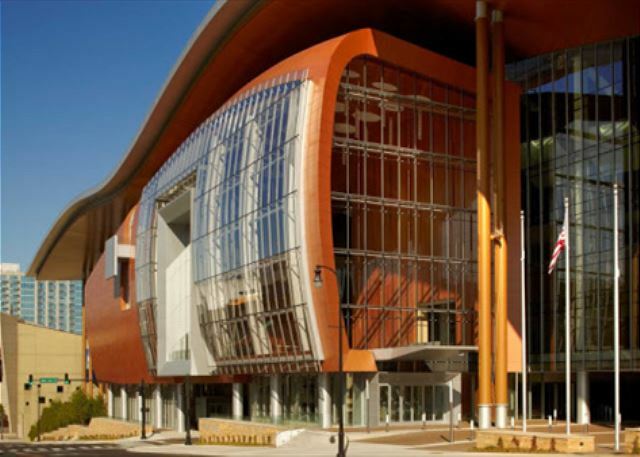 The location is perfect if you want to check out downtown Nashville, walking distance to almost everything! We came for the half marathon and found this to be a great location. Would prefer to be on the top floor with some natural light however it was a good place for us to stay and great that is pet friendly. The location and property itself was perfect; I couldn’t have asked for more. You can walk to broadway in less than 10 minutes and there’s a grocery store about the same distance away. The property shares a building with a liquor store and a hooters what more could you want? The apartment was spacious and perfect for four close friends to spend a week in Nashville. 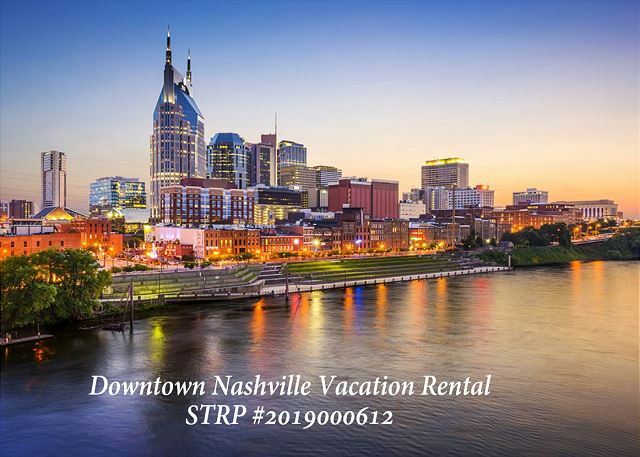 The location was perfect...walking distance to all points of interest downtown (The Country Music Hall of Fame; the Bridgestone, The Ryman Theater, every honkytonk and music venue on Broadway, etc.). We rented a car to drive to Memphis and the parking garage is close and the fee for the week was more than reasonable. Great accommodations and more than we had anticipated. Our party consisted of 4 women celebrating a girls weekend away. This place was perfect for us. I think there were at least 4 wine openers in the place :). The location was great and for being on a busy street, the place was pretty quiet. The neighbor played some loud music at unbelievable hours but responded well to a knock on the wall. The condo had everything we needed. Would have appreciated coffee filters - so glad we brought a few. 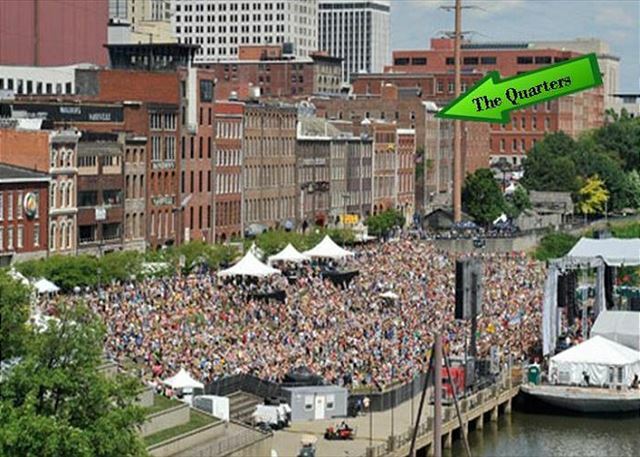 Great location to downtown Nashville. We had one of the back units and didn't hear any noise along the street. 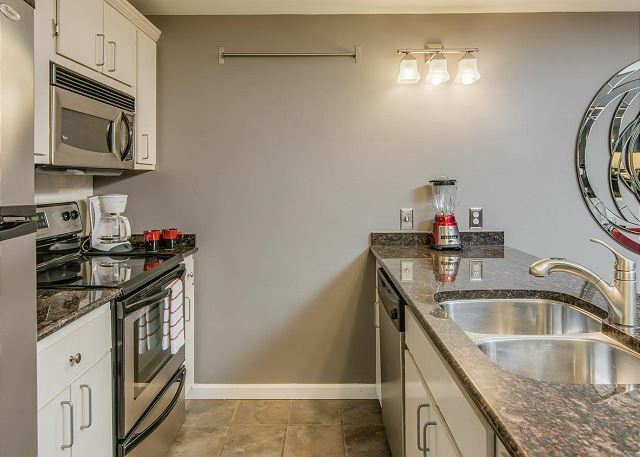 The unit was clean and amenities were as expected, however, the unit could use a fresh coat of paint. FYI, the window view that is shown in the picture did not lead to an outdoor area, but an indoor area with sky lights. I would return to this unit if I'm ever in Nashville again. great location, plenty of room, for 4 women. Some minor maintenance issues (drywall patched in bathroom, but not painted, exhaust vent in the upstairs bath was filthy). Only other issue we had was getting in on the first day, the key code we were given was wrong, but we called the after hours number & a kind, professional man got us in quickly with a new code. Felt very safe with the locked entry to the building. Very quiet even in the heart of all the action. The location is very convenient close to Broadway so we like that. The only thing that we were led to believe was that there was a washer and dryer in the unit but it is not it is in the basement. However the staff was very nice and they brought us extra towels so that we wouldn't have to do any laundry. this vacation we used Airbnb for the first time and the experience was great. Checkin and checkout smooth. Sarah T from Sioux Falls, SD does not recommend this vacation rental. 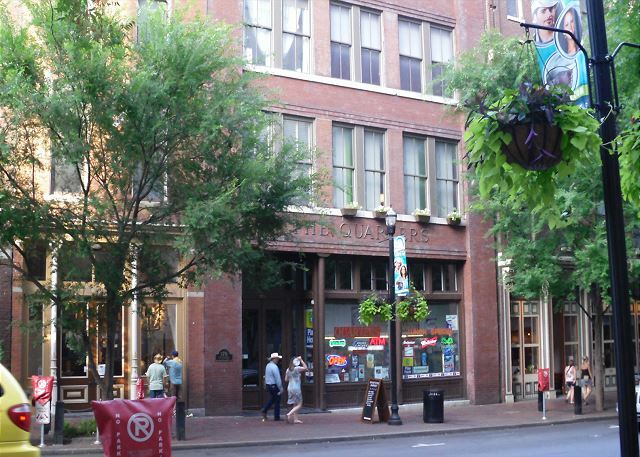 This place was in a great location, very close to Broadway and all of the action you want when visiting Nashville! The building itself and the apartment could use some TLC. The apartment was fairly clean, but run down. (Paint was chipped and scuff marks all over the walls, baseboards, etc.) And there was very minimal light with no outside windows, especially since a number of light bulbs were burnt out. If you're looking for just a place to crash while you're in Nashville, this spot is perfect. It's affordable and a great location. However, if you're looking to open time in your apartment cooking, relaxing, etc. I wouldn't recommend it. 5 women (seniors) stayed in this beautifully decorated home all winth walking distance to everything you could possibly need. House has nearly everything you would need for a short stay. Grocery stores near by for the essentials like coffee, napkins, salt and pepper. It appears that all of the Playlist Properties are extremely well kept and beautifully decorated. 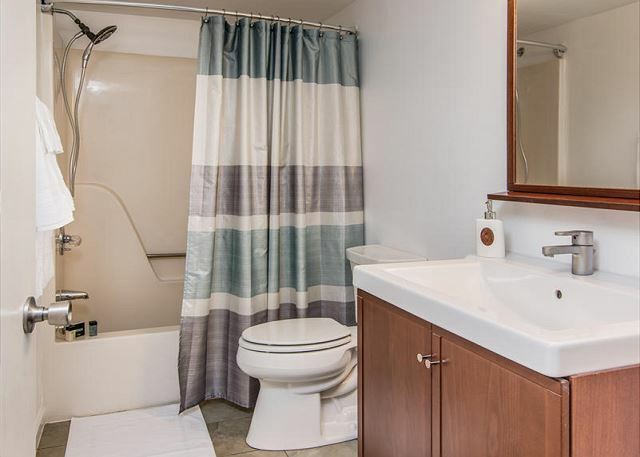 Sobwitj that said, I would pay a little extra for another full bath and private bedroom. Can't wait to take my husband there. Location could not have been better. It could have been cleaner in the building, you could tell it has not been dusted in a long time and there was a spill on the couch that was not cleaned up from the previous tenant. Could use a full length mirror, we went for a bachlorette party and none of could check ourselves out after getting ready. We had such a wonderful time in Nashville. We loved our location and could not have asked for anything better! First of all, the location couldn't be better. Right down town in the middle of everything including parking. Loft was clean, updated, and plenty of space. We had a blast! The condo is great for a close small group. We shared the upstairs bath and got ready to hit the town. Everything you can imagine is right outside the front door we walked everywhere and uber was only a few bucks for all other! We felt very safe with all the updated security and the beds were clean and comfy! The property management was super nice and helpful! Can't wait to stay here again! Wish I had loved it, location is great, but that is it. Meg M from Frisco, TX does not recommend this vacation rental. I so wanted to love the loft, but it was not what I had expected. The lobby and hallways smelled very stale. The upstairs bedroom had an awful smell like mildew. The bed did not have a top sheet, and did not look inviting at all. The bed skirt was half on and it was a sad looking thin metal frame. The bathroom was uninviting and very little room for your items. It was over all stale and hot the whole stay. Could not turn the AC below 70, this was uncomfortable in January, can’t imagine the summer. YUCK. Only one old box fan available, and it was in bad condition. It is almost bright enough to read at night and no way to make it darker, due to no shades on the top section of windows. The kicker was the wording on the checkout procedures. You will gather all the trash and take to the basement, you will load and start the dishwasher. You will turn out all the lights... I have never stayed somewhere that I was expected to do all of this before leaving. We so contemplated just leaving and losing the $1,200.00+. I really wish we had just done that since we do not get too many vacations. Everything about the experience was nice, but I have two minor complaints. 1.) The large window blinds really can't be opened unless you want the world to see your business...pics on website are deceiving. 2.) There's a large water stain in upstairs 's time to get this fixed. There were 5 adult family members that stayed in this unit and it was very comfortable. 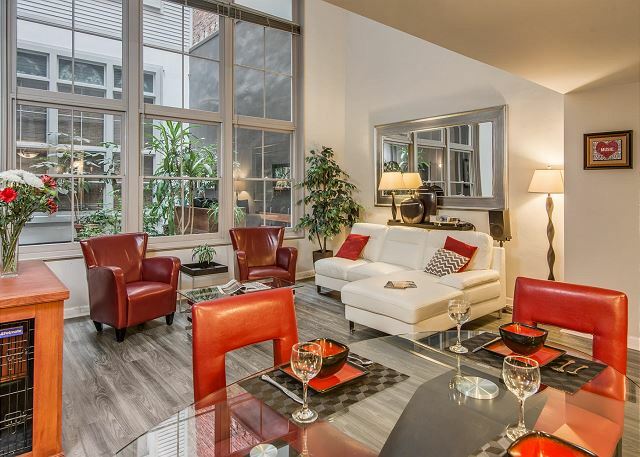 We enjoyed the closeness to downtown and the spaciousness of the apartment itself. I felt for the price the unit could have had a little more cleaning done and in the upstairs loft there was a pretty big water stain in the ceiling. Alex at the office was wonderful to work with . If nothing else I would return because of his kindness and ablity to work with us on several requests. This was an awesome location. Everything was clean and secure. There was plenty of space for 5 women to stay. The management acted quickly when the upstairs unit had a water leak into our unit. My only suggestion would be is to have coffee available to brew with filters. There is a coffee maker but no coffee. This is our 2nd visit to The Quarters and our second time staying with Playlist Properties. We stayed in the Rhythm Loft with 4 adults. Overall, the property fit our needs and definitely like that it's located in the 1st floor! I would recommend a different set up in the living room as all 4 of us hit our head on the shelf located above the couch. Amy (the owner) graciously hosted a Packer tailgate party for all the fans with free food, drinks and fun. This was so unexpected and very much appreciated! This is a great property and one I would return to (and recommend to others visiting Nashville). 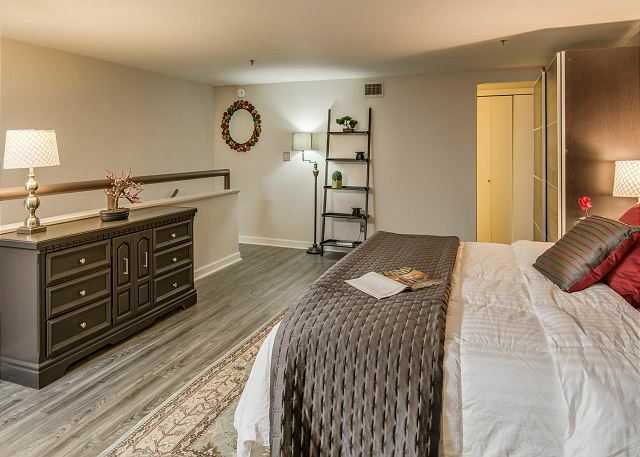 We rented the Rythm Loft for a girls trip celebrating the one-year anniversary of our 50th birthdays :) Five of us stayed comfortably in this unit. Everyone was complimentary of the beds -- very comfortable. The unit was stocked with everything we needed (towels, bedding, kitchen items). Everything worked well...except for the lower level toilet which was very slow/low pressure in flushing. I reported that to Playlist Properties when we departed so maybe they are able to correct that before your stay. The unit was very clean. Some furnishings were high-end, others just appeared to be, but were in great shape. There are no outdoor windows so when the blinds to the atrium are closed, it is pitch black. But that also contributes to the sound-proofing and good sleep. There may be bars and traffic right outside the door but you don't hear a thing. The location is SUPERB!! Close to everything. We parked our car in the covered garage space provided with the rental and had no need to take the car anywhere. 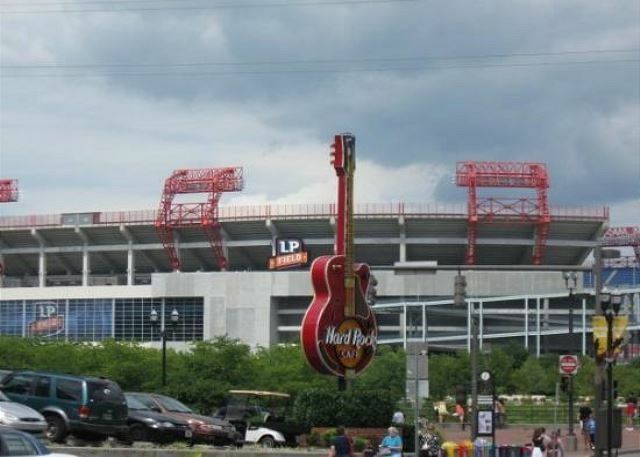 All our interests were within walking distance (Broadway bars-honkytonks, the river front, the Gulch, Puckett's, Nissan Stadium (Titan's game), and so much more! Keith M from Monmouth, NA does not recommend this vacation rental. 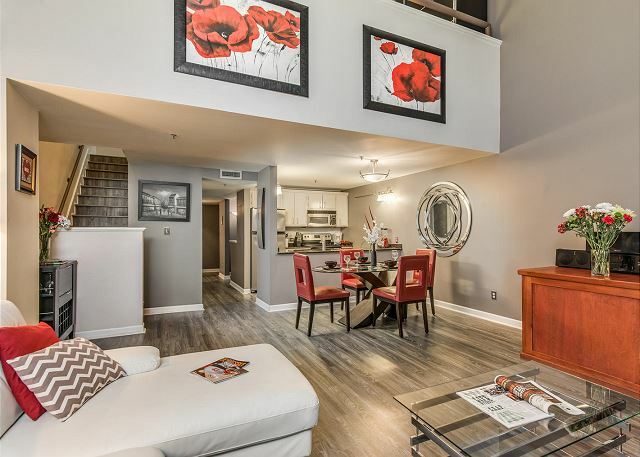 Perfect location, nice apartment, walking distance to Ryman, downtown and river. Expensive, but felt it worth a premium for comfort. However, the management company was unable to put right a noise problem notified on day 1 (of 5) which greatly affected our comfort. They did not answer repeated messages, except once with ineffective reply. If you decide to rent be prepared to receive a dozen emails listing your responsibilities and contractual obligations. Quick to take all possible payments but slow (over a month) to refund a payment taken in error. Did not offer any recompense or even apology for the inconvenience caused to us. The apartment is inside an old warehouse, and so had no direct daylight or any outside window, which was not made clear from the plethora of other less relevant information provided. Rather gloomy despite nice decoration and many electric lights. Still we had a great holiday despite the annoyance. Renting from Playlist was effortless and easier than checking into a hotel. Plus, it felt like we had our own personal concierge with their Nashville Trip Itinerary laid out for us. 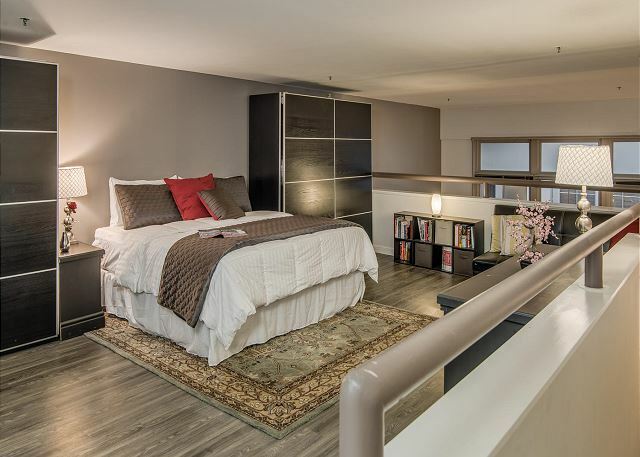 Our urban loft was updated, extremely clean and cozy comfortable with their own Heavenly Beds. Location is key. We were close to all the citie's hot spots. Location was great - easy walk to Broadway! There were some minor issues with the property- tile floor in master bath was falling apart. Lighting was poor. Several electrical outlets were not working and the refrigerator was not very cold. Futon wasn't very comfortable, but we would definitely consider coming back. This vacation rental is in a great downtown location and is quite nice with a lot of potential, but truly needs someone to really audit, clean, and provide maintaince to the property. Nothing major, but a lot of little things add up... lightbulbs out in the fridge, microwave and stove. 2 lightbulbs out in the kitchen and the other bulbs in the kitchen were mismatched in color and size. The floors were quite dirty-- I had on white socks the first day there and the bottoms were dark grey by bedtime. The kitchen chairs are in poor condition. If you are staying in the 2nd "bedroom" there is no place to hang towels or clothing. I think the cleanliness could be helped by providing some cleaning supplies for guests to use-- we had no broom for an entire house of hard woods or any type of spray cleaners available for counters and tables. With a large glass top table for eating, it was hard to keep the surface clean and looking inviting to sit at. I felt like I didn't have anything available to keep it up during the week we were there. Some of the walls need painting and additional closet space should be made available. The place looks "tired" but I guess I would still recommend it because it is pretty to look at and in a great location for walking everywhere. I loved this condo! We stayed for 5 days for a bachelorette party and it was perfect. 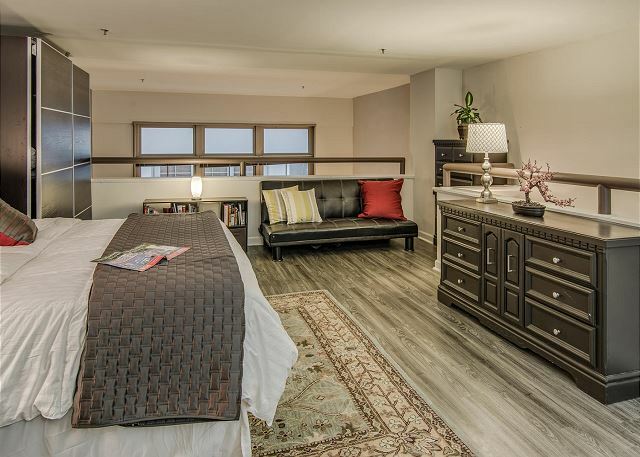 I would say that this condo is fit for 5 people, unless one person wanted to sleep on the couch. The management was quick to assist us when we couldn't get into the condo, even though it was late night. Also when we had a maitnence issue they were so quick to come out and assist despite it being a Sunday! The condo was spotless and just as it looks in all the pictures. PERFECT location! In walking distance to all the best spots in Nashville. 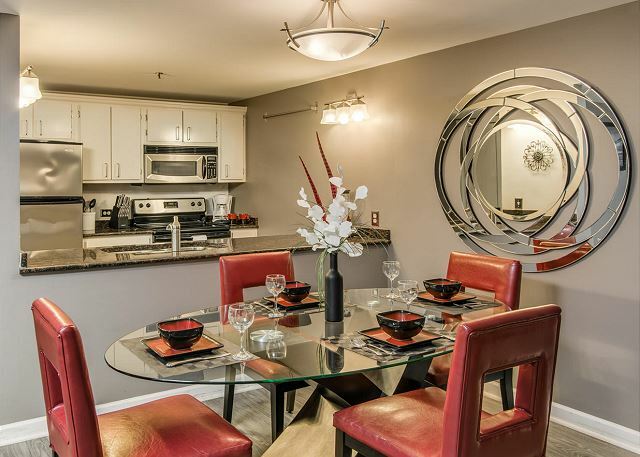 We loved this condo and would absolutely recommend to friends! 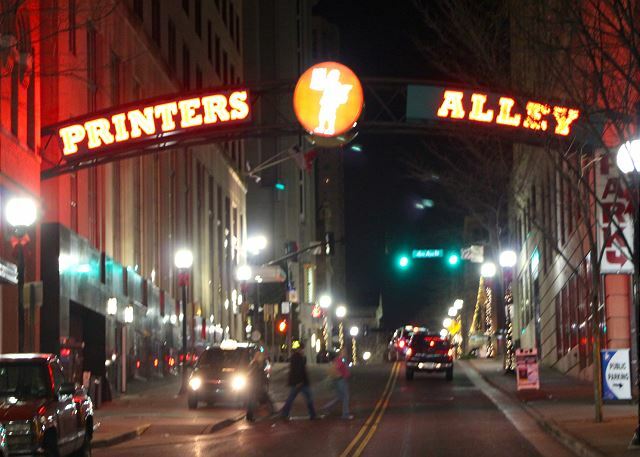 Great Place to Stay in Downtown Nashville! We had a great stay! This loft was the perfect location... we walked to everything downtown. The property management company was a delight to work with, both before we got to town and when we got there to check in - giving us good recommendations and places to avoid. I would definitely recommend this spot to anyone wanting to be right downtown, and close to everything. The only thing to be careful of is if you have 6 people (which we did)... the futon upstairs isn't a full-size futon - it's a really cozy fit for 2 people to sleep there. The condo was in a safe area close to downtown. We parked the car and didn't need it until we were ready to go home. Thanks for the 5 STAR Review! Yes, the LOCATION is amazing, perfect for walking to everything. Great time again. Thank you Playlist for all you do to make Nashville my destination vacation. Rhythm Loft was perfect for our girls weekend. Slept 4 comfortably. The king bed & pillows were unbelievable. The twin beds were comfy too. Overall the loft was amazing. From the cleanliness to the projector tv to the spaciousness to the well equipped kitchen. It made our stay very comfortable and convenient. The entrance system was effortless and we felt very secure. The location on 2nd was ideal. Thanks again and we look forward to next time! Friday and Saturday night stay here. Parked car across the street and never needed it again. Walked to all major attractions, bars and restaurants. Quiet location but in the middle of everything. Accommodations were great! Great Place. Great Location. Great Time. Broadway - was on a quieter street which was really nice. There were three of us who stayed but could have comfortably had another person. I would definitely stay here again! Great location, cool space. Very responsive to requests from guests. Great stay! It would be hard to beat this location. The place needs some updating, and the second bedroom is pretty small. Kids only size. LOVED the location, we could walk everywhere. And we actually thought 2nd Ave had the best shops, bars & restaurants! Property was exactly like the pictures. Only thing is no windows to open for fresh air. We had trouble with the stereo/TV system, as we could not hook up our iphone. Otherwise, perfect! The condo is exactly as pictured and was neat and clean. The kitchen is well stocked. The location is fantastic and we enjoyed our stay. On the negative I didn't like the projector TV, and would have liked a TV in the loft master bedroom. We could have also used more towels...only had 4 towels for four people for 3 nights. Overall it was a very nice property for the price in a downtown location.